Our Clear Food Bags from Handguards, Heritage Bag, Ziploc and Fantapak are perfect in the kitchen for seeing what is in the storage bags. Clear bags make identification of the contents quick and easy. These Restaurant Supply Clear Food Bags are strong and leak resistant for foodservice kitchens. 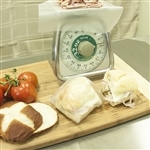 Handgards Deli and Speciality Bag Clear - 10 in. x 8.5 in. Handgards Food Storage Bag Clear - 5 in. x 4.5 in. x 18 in. Handgards Food Storage Bag Clear - 6 in. x 3 in. x 12 in. Handgards Sandwich Bag Clear - 7.5 in. x 7.5 in. Handgards Food Bag Clear - 10 in. x 8 in. x 24 in. Handgards Friday Preportioned Bag Clear - 6.5 in. x 7 in. Handgards Sandwich Saddlepack Bag Clear - 6.5 in. x 7 in. Handgards Saturday Preportioned Bag Clear - 6.5 in. x 7 in. Handgards Sunday Preportioned Bag Clear - 6.5 in. x 7 in. Handgards Thursday Preportioned Bag Clear - 6.5 in. x 7 in. Handgards Tuesday Preportioned Bag Clear - 6.5 in. x 7 in. 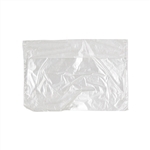 Handgards Wednesday Preportioned Bag Clear - 6.5 in. x 7 in. 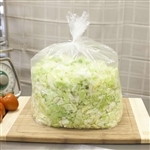 Handgards Low Density Food Bag Clear - 18 in. x 24 in. Handgards Flat Pack Sandwich Bag Clear - 6.5 in. x 7.5 in. Buy your wholesale Clear Food Bags from the leader in restaurant supply. They seal tight and maximize the space in your refrigerators and freezers.